This recently renovated all suite townhouse has deluxe qualities and is loaded with more features (many hi-tech) than any rental you will probably ever find. (See below.) Yet the rental rates are very affordable! It is perfect for two to six adults, and up to eight with children. The location is unbeatable! In winter this unit is on a ski-in/ski-out cross-country ski course groomed daily and in summer it is on the 18th fairway of the Park City course! 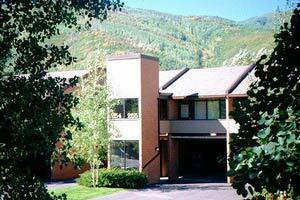 It is located only one block from shopping, restaurants and theaters and 3-blocks from the Park City lifts. The lifts at Deer Valley are only a few minutes away by car or several minutes using the free shuttle from a major bus route stop only two buildings away. This 3 bedroom /3.5 bath unit has been totally remodeled with granite counters and maple cabinets throughout, slate floors in the entry and kitchen and travertine floors in the bath. 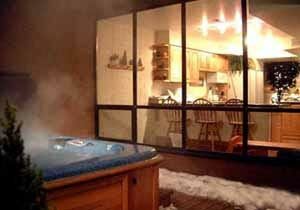 It is loaded with features including a private hot tub that seats six, a gourmet kitchen, a large woodburning fireplace with gas starter (and free wood), a home theater system (see components below), covered parking, washer and dryer, a home office (computer optional), Olympic Slope views and much more. 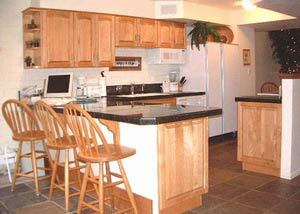 All three bedrooms are suites with private baths & TVs. There are six beds; two bedrooms have a queen and twin bed in each and the other has a queen bed. A sleeper sofa downstairs is close to the half bath. 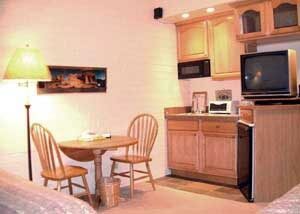 The Master Suite features a full kitchenette, bookshelf stereo/CD, VCR and TV, and a separate entrance. Complex amenities include a large outdoor heated pool, tennis court and a recreation building with spas, saunas, lockers and rental office with concierge. 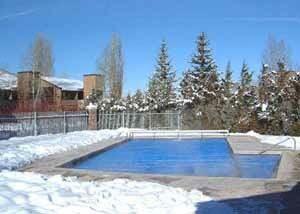 The unit faces the Park City Golf / Ski Course and is only 1 block from the new Pro Shop & range. In summer, fabulous Fly fishing is nearby on the Provo river and jogging, hiking and bike trails are a block away that extend for miles. Winter activities other than skiing (alpine & cross-country) and snowboarding that are nearby include snowmobiling, sledding, snowshoeing, tubing and sleigh rides. Within just a three mile radius are three World Class ski areas including The Canyons and Deer Valley, besides Park City. Within 30-miles are other major ski areas such as Alta, Snowbird, Brighton and Solitude, Sundance - and the Salt Lake Airport. 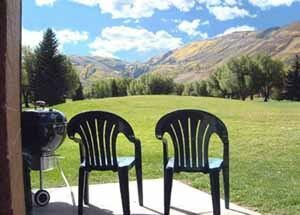 In summer and fall, there are great mountain golf courses nearby at reasonable rates; one is out the back door. Easily ski a different ski area or play a different golf course each day of a week’s stay - within a short drive away. 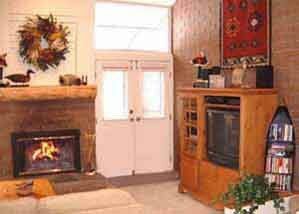 Washer/dryer, wall safe, gas fireplace starter and free firewood, 2-phone lines, boot-glove dryer, humidifiers (central/portable), steam irons(2) & boards(2) and outdoor sensor lights. Home theater with Sony 5.1 channel digital stereo and 6 speakers, Sony 32" TV, DVD/CD/MP3 player, tape player, VCR, A/V switcher w/ video game cables. Libraries for music (CD/tape), books & games. Each bedroom with TVs, CD/cassette/stereos, fans (summer) and private baths. Master bedroom with kitchenette (microwave, frig, sink/disposal, toaster oven), extra space heater & additional entrance. Kitchen also includes smooth top range, side by side frig and pull out cabinet shelves. On location: also cross country skiing & free bus shuttle. 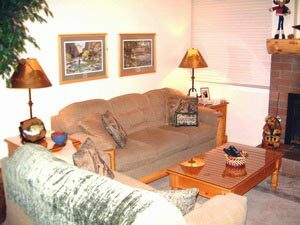 Walking distance (1 block): restaurants, shopping, rentals & cinemas (less than 3 blocks): Park City Mt. resort with alpine slide, miniature golf & climbing wall. Skate board park. (less than 7 blocks) Historic Park City & athletic and tennis Clubs. Mid Season 1/6/2002 3/30/2003 $475.00 - - 5 Nts. Summer 6/1/2002 9/5/2002 $285.00 - $0.00 3 Nts. Fall 9/8/2002 11/15/2003 $265.00 $1,500.00 $0.00 2 Nts. Low Season 11/16/2002 12/7/2002 $395.00 - - 2 Nts. Holiday 12/21/2002 1/5/2003 $575.00 $3,995.00 - 7 Nts. Inquire about our Summer and Early Bird Winter Specials! From 10% to 25% Off!! In Winter, Sunday - Tuesday Departures may require premiums and posted rates are for 1-week Saturday - Saturday stays. Deposit: Varies by length and season. Minimum $100. Cancellations and Refunds: Full refund within 2 months Winter & 1 month Summer. Responsible for days not re-rented plus loss of Security Deposit or Administration Fee. Other Fees: Long distance charges; local calls are free. Required Stay: 5 nights, winter 2-3 nights.